Surya Namaskara, or salutation to the sun, is an important yogic practice which dates back to the ancient vedic period when the sun was worshipped as a powerful symbol of spiritual consciousness. From its esoteric origins Surya Namaskara has developed into a practice of twelve postures which weave together to generate prana (subtle energy), aiming towards the purification and rejuvenation of the practitioner. 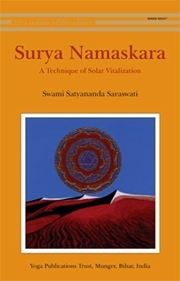 This book discusses in detail the full practice of Surya Namaskara, including the surya and bija mantras, points of concentration and extended guidelines to aid both practitioners and teachers. An in-depth physiological study of Surya Namaskara supports its present day use as a powerful therapeutic practice. Swami Satyanada Saraswati is an authority on Yoga and more than anything else the popularity of his other Books Kundalini Tantra,Asana Prana Yama Mudra Bandha, Nawa Yogini Tantra,Prana/Prana Yama/Prana Vidya,Meditation From The Tantras, Sure Ways To Self-Realisation more than prove his prowess in his intense knowledge and the easy to understand language style. He is the Founder of Bihar School of Yoga, the only school of it's kind.